Just to say that there are some lovely pictures of ornamental hedges of all sorts here. 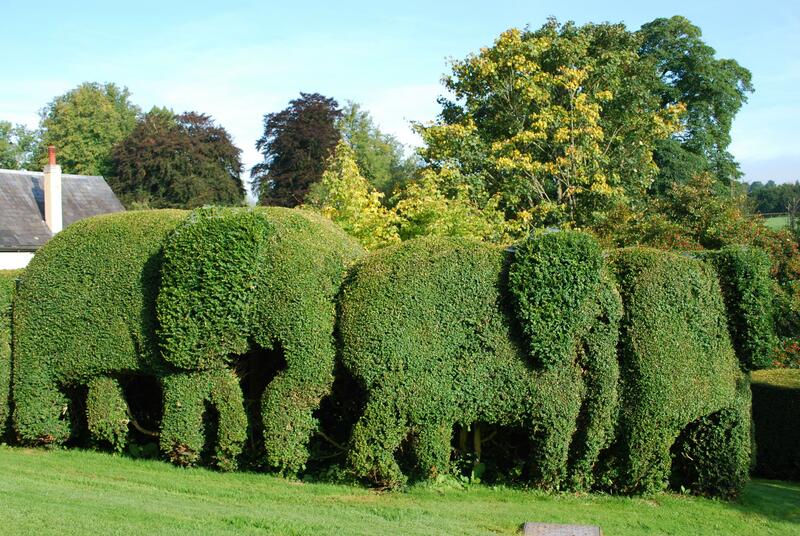 Gavin Hogg, who lives near Powys, was kind enough to send me a couple of photos of the topiary elephants he created – there is a picture in the book, and here is the one that I didn’t use. I think Radio 4 is moving on to topiary tomorrow, something a bit lighter after the relatively dense stuff about landscape and enclosures today. Arts and crafts topiary hedges at Otterington Hall. 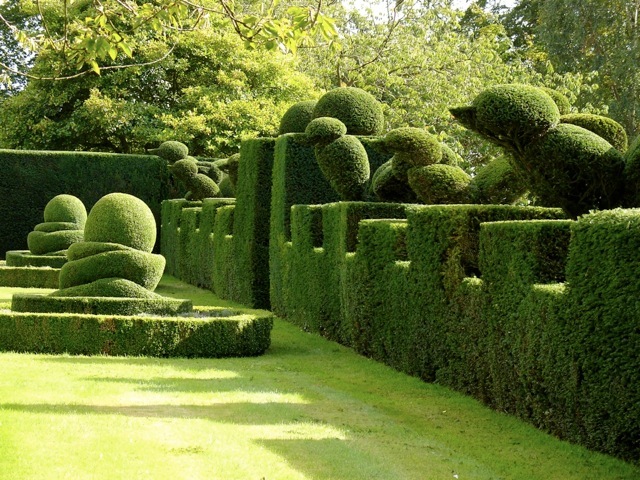 Chris Crowder, the head gardener at Levens Hall, was kind enough to end me these pictures of the beautiful topiary hedges at Otterington Hall in North Yorkshire. Designed in the arts and crafts style, they date back to to approximately 1900. Otterington is not generally open to the public but they do have very occasional open days when the gardens can be viewed. I wanted to use these in the colour section in the book, but unfortunately they are not quite a high enough resolution, so instead I thought I would put them up here. 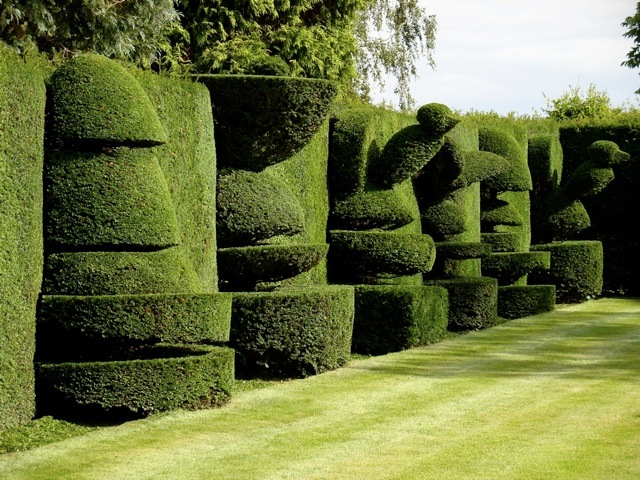 This is another picture that was cut from the book for space reasons, a nice pair of stilt hedges at Hatfield. 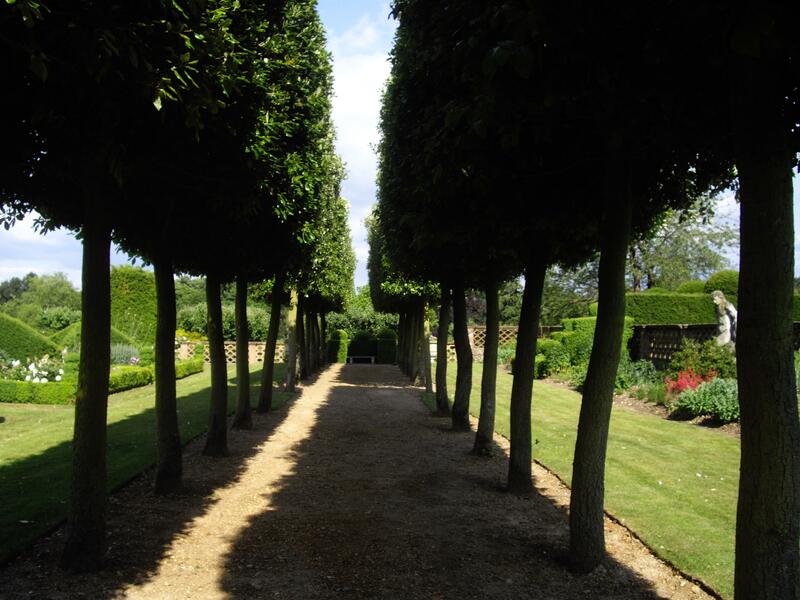 Stilt hedges (lines of adjacent trees cut so that it looks like a hedge on trunks) have been a popular formal garden element over the years – there’s another nice example at Hidcote Manor Garden but that one is in the book so I won’t put it up here just now. Anne Wareham, author of The Bad Tempered Gardener, has rightly taken me to task for not including her gorgeous hedges at Veddw House Garden in my book. I haven’t made it out to Monmouthshire in the last year or so, and thus haven’t been able to see it in person yet, but it is definitely a garden I would love to visit when I get the chance. On the website there are some great pictures of the hedges, including some lovely winter views. 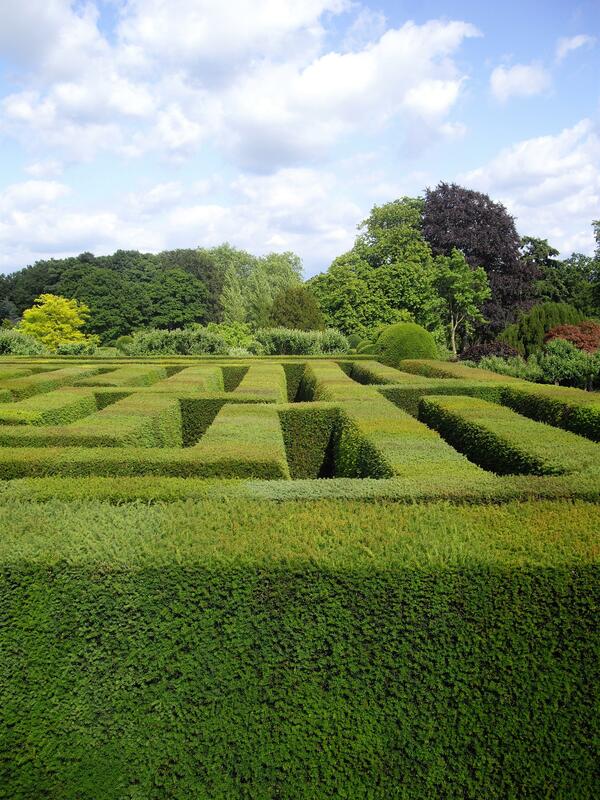 This is Hatfield’s knot garden, with its lovely low maze and topiaries. The site of the garden originally lay under a wing of the house which was devastated by a fire in the early 19th century. The brick paths were handlaid by the prizewinning hedgelayer Larry Laird, from bricks recycled from a demolished bothy in the grounds, by hand. 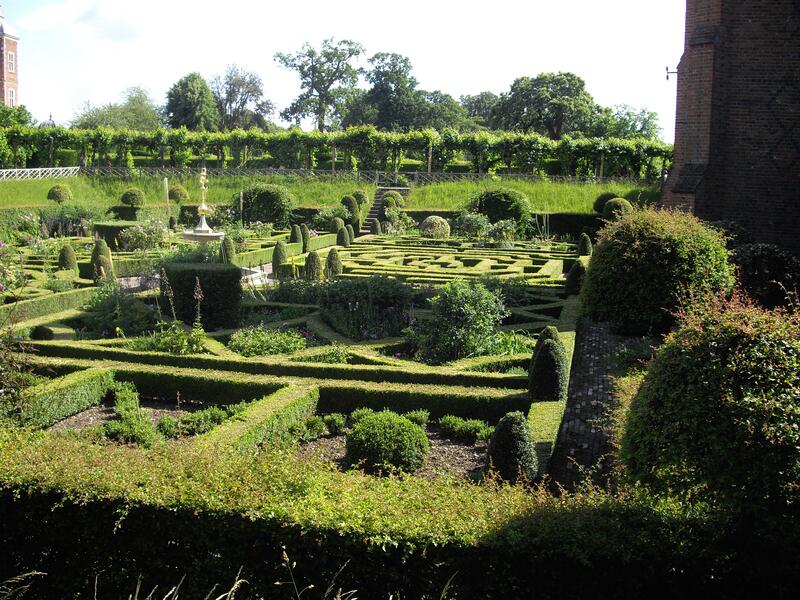 Although the garden was only created in the 1980s, the final result has the feel of a renaissance formal garden. 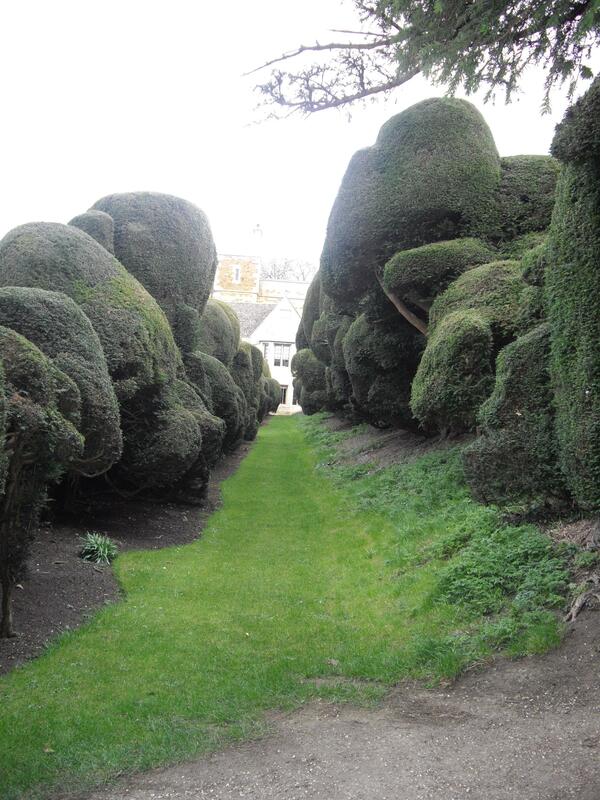 There is also a much larger yew maze in the east garden, which is a Victorian creation – this garden is only open to the public on designated days. 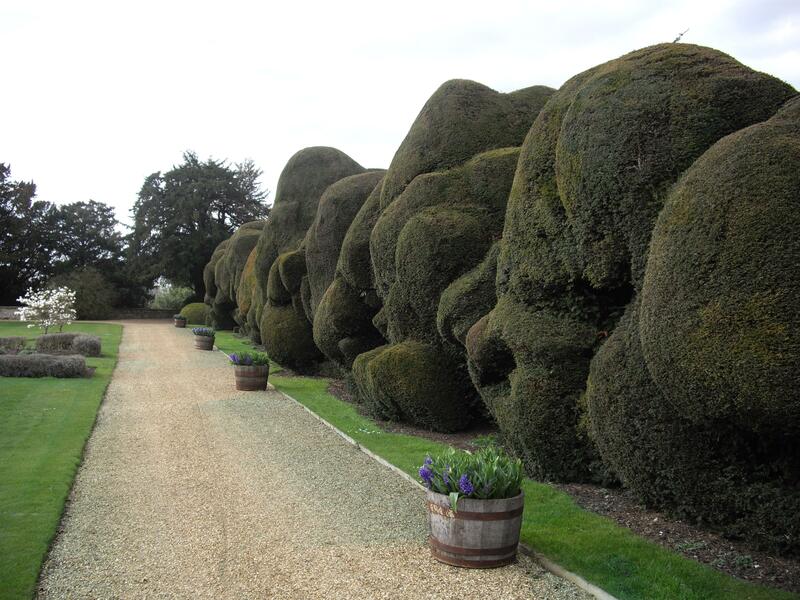 One of the most spectacular and weird hedges I have ever had the pleasure of encountering is the Elephant Hedge at Rockingham Castle. Perched on a natural escarpment above the Welland Valley, Rockingham was built on the instructions of William the Conqueror and has been owned and gradually rebuilt by one family (the Watsons) for the best part of five centuries, since the crown relinquished it in the sixteenth century. The castle is an accumulation of different periods of architecture, with a heavy dose of Tudor. Stern battlements give way on one side to a beautiful terraced lawn with views across the Midland countryside below. From there you can observe the typical local patterns of enclosed pastures, with white sheep dotting the green grass and darker hedges marking the field boundaries. It is easy to imagine the lawn hosting croquet games, with cucumber sandwiches and tea served in china cups. Dividing this lawn from a formal garden area is the massive Elephant Hedge. It is a strange structure made up of smoothly trimmed, undulating curves that could be taken to suggest the monumental curves of elephants’ bodies. It is divided into two parallel sections, with a shaded walkway concealed in between, and an entrance halfway down the lawn side through which you can enter its depths. It is 450 years old, having survived a Royalist siege in the English Civil War, and all the many wars and upheavals that have happened since then.